It seems like gaining weight should be a breeze -- and it is, if you don't worry about nutrition -- but increasing calories and eating healthy foods means you can't rely on sugar-rich foods. Beans can support your efforts in this. They have enough calories to make a difference on their own, and you can multiply their impact by mixing them with other high-calorie foods. Plus, beans are great sources of fiber, protein and nutrients. Beans work well as part of a healthy, weight-gain plan because they're packed with fiber, iron, magnesium, potassium, zinc and folate. Thanks to these nutrients, beans count toward your daily vegetable requirement. They're also such a good source of plant protein that the U.S. Department of Agriculture includes them in the same protein group as meat, poultry and fish. To gain 1 pound weekly, you'll need to consume 500 extra calories every day. Beans can make a significant dent toward that goal. They could even fill all 500 calories if you can handle eating 2 cups of beans over the course of a day. Depending on the type of bean, 1 cup has between 200 and 300 calories. Adzuki beans and chickpeas are good choices because they're at the high end, with 294 and 269 calories per cup respectively. Soybeans, navy beans and white beans have between 249 and 254 calories in a 1-cup serving. All other beans fall between 200 and 250 calories per serving. Along with boosting calories, a weight-gain plan should include resistance exercise to ensure you gain muscle weight rather than excess fat. This type of exercise focuses on making muscles work, which strengthens them and also stimulates the synthesis of new muscle. After a workout, it's important to refuel with carbohydrates and protein. Carbs refill glucose stored in muscles -- glycogen -- so they have a ready source of energy, while protein repairs and builds muscle tissue. The American Council on Exercise recommends refueling 30 to 45 minutes after a workout with a snack that's about one-part protein for every three-parts carbohydrate, or 10 grams of protein for every 30 grams of carbs. Beans fit that profile. The American Council on Exercise recommends eating whole-wheat pita with a garbanzo and black bean spread for a post-workout recovery snack. The average amount of protein in 1 cup of beans is 15 grams and carbs average 47 grams, which is almost a perfect 1:3 ratio. 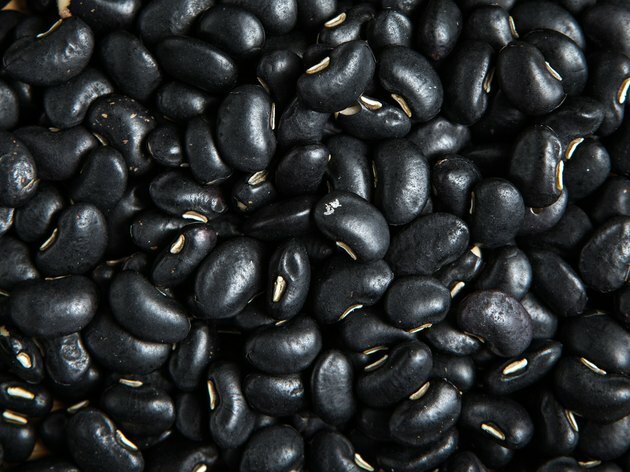 Some types of beans have a little more or less, but they still have the carbs and protein needed to support muscle recovery. As protein generates muscle synthesis, you'll develop lean mass that adds to healthy weight gain. The best way to maximize the calories from beans is to combine them with other high-calorie foods. Beans, salsa and cheese on a whole-wheat tortilla have at least 400 calories and possibly more, depending on the type and quantity of ingredients you use. Add beans to soups or make a salad that features beans. For example, combine white beans and chickpeas with sliced avocado, nuts and tahini dressing in a salad of greens. A 2-cup serving topped with half an avocado and an ounce of nuts adds up to at least 700 calories without the dressing. Pureed beans work well in many casseroles and sauces. Stir pureed white beans into the cheese sauce for mac-and-cheese or mix pureed kidney beans into the tomato sauce you'll use over whole-wheat pasta. Increase calories at dinner by stuffing a baked potato with beans, corn and onion. Instead of plain brown rice as a side dish, mix the rice with garbanzo beans, dried apricots, walnuts and orange vinaigrette. One-half cup each of brown rice and garbanzo beans, plus a half cup of dried apricots and an ounce of walnuts delivers about 632 calories. Snacks are a prime opportunity to get extra calories, but don't fill up so much that you're tempted to skip meals. Consistently eating meals and snacks is the key to consuming enough calories to add pounds. Make a satisfying savory snack by roasting beans the same way you'd roast veggies -- toss them in oil, sprinkle with seasonings and roast them in the oven until they're brown. For convenience, keep bean dip on hand. Hummus is one of the most popular, but you can make a dip from any type of bean. After pureeing the beans, thin them with olive oil, salsa or lemon juice, then add favorite seasonings such as cumin, ginger, garlic, paprika or horseradish. In addition to using the dip with whole-wheat crackers, you can also spread it on sandwiches for a boost of flavor and calories. Consider adding beans to smoothies. Beans that don't have a strong flavor, such as pinto beans and white beans, can be blended into almost any type of smoothie. If you're ready to experiment, try a smoothie made from black beans, dark chocolate, whole milk and bananas, for a beverage that provides about 600 calories.